I hope you all had a relaxing holiday weekend and have been able to get back into the daily grind easily (those of you not in the U.S. can feel lucky to have had a head start on work this week). While having a lovely time with family and friends outside of the city — and when I wasn’t eating ice cream or spinach dip — I made a ton of progress on my Waterlily. I did have to scale back production over the last couple of days to meet some work deadlines. That’s also why I’m launching this giveaway a tiny bit later than I’d originally intended, but hopefully it will be easier for you to participate over this upcoming (shorter) weekend. Now that you’ve gotten to know Michelle of Berry Colorful Yarnings a little better, it’s time for me to give out the three skeins of yarn and the fiber she so generously dyed up to celebrate the launch of Indie Untangled! I’ve decided to conduct these giveaways by doing a little social media “tour,” so you will have a few different ways to win one of the skeins. I’m going to lay out the schedule for each of the giveaways in this post, so come back here on those days for all of the details on how to win. *This portion of the giveaway is now closed. Congrats to the winner, alikazaam! Enter to win this skein of Squishy DK by following Indie Untangled on Twitter, and tweeting about what is currently on your needles. Use @indieuntangled so I can find your tweet. A photo is not required, but is definitely encouraged. It’s also not required that the yarn you’re using is from an indie dyer, but if it is, and they are on Twitter, please include their handle in your tweet. You have until midnight EST on Monday, June 2, to enter. Today, we move to Pinterest. To win the second skein of Awesome Sock, create a Pinterest board with your favorite patterns for self-striping yarn. To win the fiber, create a Pinterest board with your favorite patterns using handspun. For both, make sure to use #indieuntangled in the title of your board so I can find it! Bonus: If you’re on Instagram, you can also enter this last part of the giveaway by following Indie Untangled and posting a photo of one of your latest FOs to win the yarn, or your latest handspun to win the fiber. Please be sure to tag @indieuntangled in your post. You have a few days for these — create your board or post on Instagram by midnight EST Sunday, June 8 [EDIT: deadline has been extended so you have time to Pin-stagram over the weekend.] Good luck and have fun! *This part of the giveaway is now closed. Congrats to the winners, @bellylaughter (fiber) and @julienojulesjukes (yarn)! This entry was posted in Giveaway and tagged fiber, free stuff, giveaway, pinterest, twitter. Glad you like it! Michelle incorporated all the Indie Untangled colors. Have you decided what you would make with it? pretty yarn! I would probably make Lara Smoot’s Minion socks! unless I got distracted while on ravelry and pulled away into other ideas…but that never happens! I would knit plain vanilla socks like http://www.ravelry.com/patterns/library/gusset-heel-basic-socks the better to showcase the beautiful yarn. I would definitely knit a simple striped sock, I have too few of those! What a beautiful colorway! I would certainly make a pair of socks for myself with this- something like Cafe Macchiato by Marian Moldan- simple with a little change up to break up the plain stockinette. This is supposed to be my Year of the Sock and I have yet to cast on any. This would be a perfect opportunity! I took a Grok the Sock class from Stephanie Pearl-McPhee and I’m dying to try making my own socks without a pattern. I think I would just like them as a lovely pair of striped socks to hightlight the pretty yarn. Thanks for the chance. I think this yarn would make a great Hitchhiker or Multnomah! 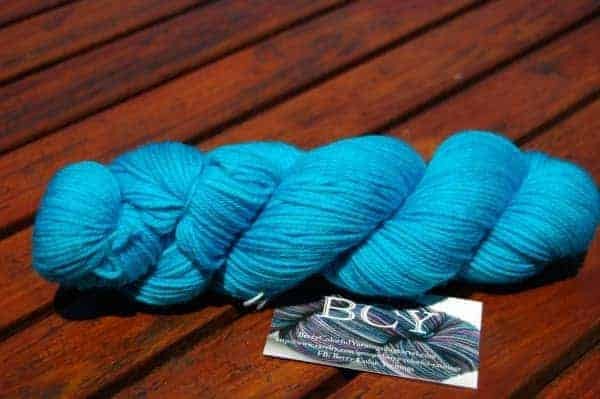 I would be really keen to try the mystik spiral socks that beautiful yarn! I would make socks that showcase the striping like the classic Jaywalker by Grumperina. I would make a pair of socks, probably with the blurred lines pattern or the Parting it up or getting down socks. A pair of socks for one of my sons (ages 26 and 28). They get a pair of socks, each, for Christmas and birthdays, and they are pretty adventurous – they’d both love that colorway! Georgeous colorway. I would make another Mashpee Shawlette. I would make vanilla socks or Mystical Socks with OMG heel. I’ve been wanting to try that pattern! I’d make a pair of socks, the colors look so wonderful together. Plain vanilla socks that would show off the beautiful colours. I think all of these will really shine in a self-striping yarn. Love the colors! I just moved into a new house with my bff and his son – I think this yarn would make a perfect hat for the wee one. And now that we’re (sort of) settled in I can actually start knitting again, hooray! The drawing date is my birthday! I would make a birthday present to myself, I would make a pair of sock that would show off the beautiful colors! Beautiful colors… I think that Wingspan (http://www.ravelry.com/patterns/library/wingspan-2) would be lovely choice for this yarn. I think I’d knit “Fruit Stripe Gum Socks” by Leah Oakley. Thanks for the chance to win some beautiful yarn. The sock yarn would be gorgeous for a pair of dragonscale mitts – http://www.ravelry.com/patterns/library/dragonscale-gloves – the striking makes the scales be different colours, and you can’t have too many of these! I’ve been itching to cast on something from Stephanie van der Linden’s Op-Art Socks, so I think I’d go with either the Ludwig sock or Gunter sock… something that highlights the striping and plays with it in interesting ways! I would definitely make a pair of socks with it. I’m also envisioning a Hitchhiker or a summer scarf. Love the blues! Ooh, I’d love to try my hand at a lacey sock with those stripes! It would be an interesting contrast. I’ll have to look around for some pattern inspiration…. I would make a Sockhead Hat with these beautiful colors. Love these colors in the fiber, too! I think Clarina Irene shawl would be pretty! Well a most fantastic pair of socks, of course! I am considering purchasing all the volumes of the Knitter’s Curiosity Cabinet and having a grand time. So beautiful colours. I would knit a pair of wonderful cosy and stripey socks for me. That is simply lovely! 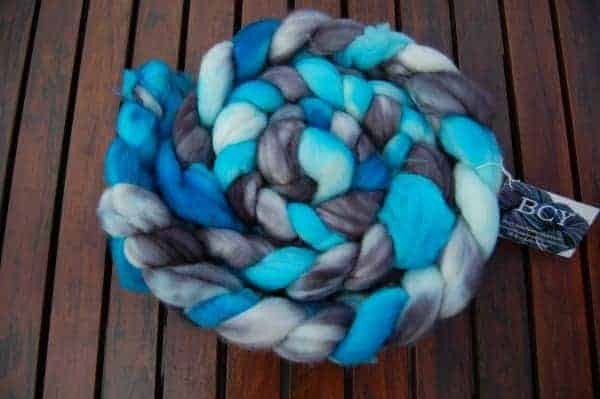 I would love to make a Hitchhiker with this yummy yarn! Maybe through a bit of black in there too! Wow that’s pretty! Thank you for a chance to win! Yum! I enjoyed making the Sideswipe socks (http://www.ravelry.com/patterns/library/sideswipe) so much that I’ve been looking for an inspiring colorway to make another pair. 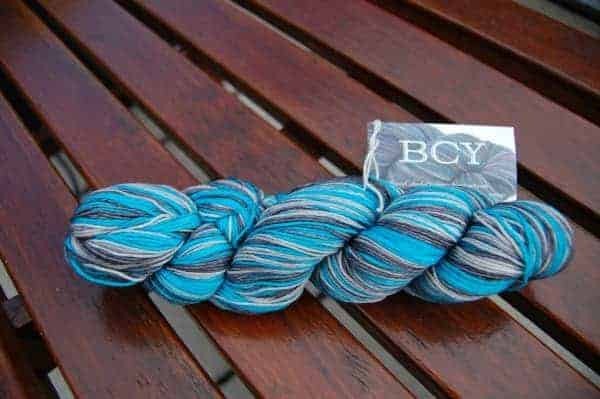 The BCY launch celebration skein is spectacular and I think it would be a perfect pairing. Although it might also make a fun pair of Little Purls of Wisdom (http://www.ravelry.com/patterns/library/little-purls-of-wisdom). Thanks for the giveaway and for bringing this yarn company to my attention! I know it’s not very original, but I would make a pair of simple toe up socks. I’ve never made socks before and I’m eager to cast on my first pair, just as soon as I get my hands on some nice sock yarn. Hi! Fab yarn!, great match too… I’d really like to knit the secret pocket socks from Cat Bordhi’s Sweet Tomato Heels Ebook…can you imagine my little pockets with some beads in or a cable needle, stitch markers etc for my next project? Tee hee!! Mind I’d prob forget and put them in the was still with contexts in!! I am itching to get some socks cast on! This would be wonderful. Pattern? Hmmm.. try a new pattern? or use my standard Simple Skyp socks because it fits so well and is so wonderful to knit. Decisions, decisions…. How fun to see your logo on yarn! I would make strandwanderer if the color repeats are long enough (http://www.ravelry.com/patterns/library/strandwanderer) otherwise, I might try some jaywalkers again or perhaps just plain vanilla socks so I could let the yarn shine. I’m addicted to these Mystikal Spiral Socks and they show off self striping in an amazing way. I love blues and this color is beautiful!! I have never worked with this yarn but I would love too!!! I would knit fingerless mitts so I can always feel the beauty of the yarn and the color!!! An awesome pair of socks!!! With colors that pretty, I’d say stick with a plain vanilla sock! I love the Fish Lips Kiss Heel to keep my socks fitting extra well! Oooh, those blues!!! I’m currently working on the Despicable Socks in Michelle’s Minion Colorway but I have had the Sockhead Hat in my queue forever! I think that would be a good choice for the blues!!! I love the colors in the variegated yarn! It’s so cool that it matches your logo! I think that the Awesome Sock would look great as a pair of socks, of course, but I think that I would make a Hitchhiker with it! I’ve been wanting to make Hitchhiker for a while, and the blue/grey self striping would be beautiful. I would have a hard time deciding whether to make a pair of Vanilla Latte Socks or maybe “Like a Leaf on the Wind” shawl…I’m in a “shawl roll” right now (3 in the month of May!) but really want to try my hands at a pair of socks…so, who knows? I’d definitely make socks, probably some sort of stranded pattern like Show-off stranded socks or Harvest Dew. Oh, that pretty skein of Awesome Sock just cries out to be the simplest, plain vanilla sock, the better to showcase the lovely colors! Thanks for the chance to win. I would make my very first pair of socks. Well, I’ve wanted to make a Hitchhiker for while now, and these colors are sooo pretty (and shades I wear near my face), so I’d probably make one of them with this if I won it. I love the magic that self-striping sock yarn produces right before your very eyes so it would have to be a pair of plain vanilla socks for me to show off the striping effect to its best! I would definitely make socks!!!! This yarn would make up into a gorgeous pair of striped socks! I would knit socks and fingerless gloves if there are enough leftovers. The colourway is wonderful! I would make socks, just plain socks with a Cat Bordhi Sweet Tomato Heel and let the self striping colours speak for themselves!